Home Costs > How Much Does an Alaskan King Bed Cost? How Much Does an Alaskan King Bed Cost? When most of us think of a bed size, there’s good chance you think of the most common ones — twin, full, queen and King. While these do tend to be the most popular choices, did you know yet another size exists — the Alaskan King bed? One of the largest sizes available on the market, the Alaskan King measures nine feet wide by nine feet long. To envision this, it’s more than a queen and twin pushed together. 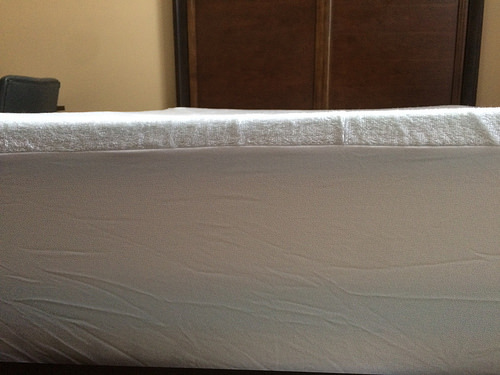 How much does an Alaskan King bed mattress cost? 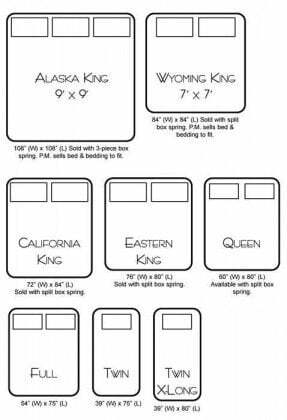 The cost of an Alaskan King bed, as with any bed, will greatly depend on the brand and where you purchase it from. With very limited choices online, it was very hard to find prices as very few mattress/furniture retailers sold this size, either due to the lack of demand and/or limited availability. We were able to talk with one retailer that stated that you could custom order this type of bed, but the costs, depending on the quality and brand you did choose, as mentioned, could cost as little as $750 for an economically sized mattress to as much as $5,000+ for a TempurPedic-like bed. This is often the case as with any mattress purchase, and these prices would not include the costs of the bed frame. In conclusion, there’s a 99% chance you will need to customize this mattress size as you will not find one online or via a local retailer. On Reddit.com, members discussed the costs of an Alaskan King bed and most never heard of one before, but like what we found out, it would be a customized job due to the larger-than-average size. The top response stated that companies such as McCrosky Mattress in Calfornia could do this as well as smaller manufacturers, but if you were to want a name brand like Serta or Sealy, then there’s a good chance they would not be able to accommodate your request. In the end, they came to the conclusion that the costs could be all over the place, ranging from as little as $500 to more than $10,000. Due to the larger-than-average size, you still need to factor in the bed frame, box spring if it isn’t included in the initial purchase and the bed sheets/comforter as most of the time, these may need to be custom ordered as well. All of these costs, just like the mattress, will greatly depend on the quality, brand and where you purchase it from. It’s safe to double or even triple your mattress cost to get a rough idea of what you’re paying for a total bed set. The main difference between an Alaskan King and California-sized mattress will be the size. As noted in the graphic above, a California King will measure 72 inches by 84 inches, whereas an Alaskan King will measure 108 inches by 108 inches. Another difference to be noted will be the manufacturer. As a California King is fairly common, you can readily find it online and in a local mattress store, whereas an Alaskan King will need to be specially ordered almost 99 percent of the time unless you purchase it on a third-party market. Due to an Alaskan King having to be special ordered, the price, on average, can be up to 50% more when compared to the California King, even if it were made from the same materials.